When the name of Jaipur comes to anyone’s mind, they instantly start imagining about the royal lifestyle of the people here. This unforgettable city is the capital of the state of kings, Rajasthan. The hospitality & culture of the Pink City is absolutely impeccable. Jaipur was founded by Maharaja Jai Singh II in the year 1727. So, it is very much a historical place with great architecture & infrastructure perfection. Talking about the architecture, the 3 famous forts of Jaipur are a major center of attraction. 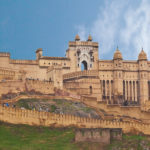 These forts are namely Jaigarh Fort, Nahargarh Fort & Amer Fort. The name Pink City was given to Jaipur because of the color of stone used to construct the buildings & monuments. 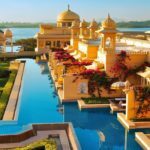 Here we are listing out some of the most popular places to visit on your Jaipur Trip. Jaipur is the home for many ancient architectural marvels. 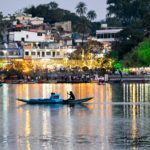 These are some of the best places where tourists come & never want to leave as they indulge in the royalness of the city. Here are some of the spots which you must not miss out on your Jaipur Trip. Hawa Mahal: The palace of winds or Hawa Mahal is the Crown Jewel of Jaipur. It is constructed with Red & Pink Sandstone. Hawa Mahal was constructed in 1799. It is a must visit spot when you’re exploring the Pink City. City Palace: The City Palace is a palace complex in Jaipur which consists of the Chandra Mahal & Mubarak Mahal Palaces. Other buildings are also the top spots in the complex. The museum, gardens & courtyards are the centers of attraction. Jaigarh Fort: Constructed by Sawai Jai Singh II in 1726, Jaigarh Fort is the home for Jaivana Cannon. Jaivana was once the largest cannon on wheels in the world. 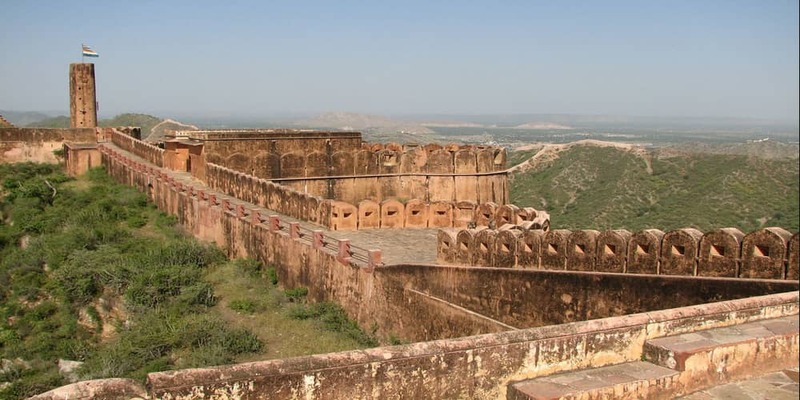 Jaigarh is known as the fort of Victory & is a must visit spot. 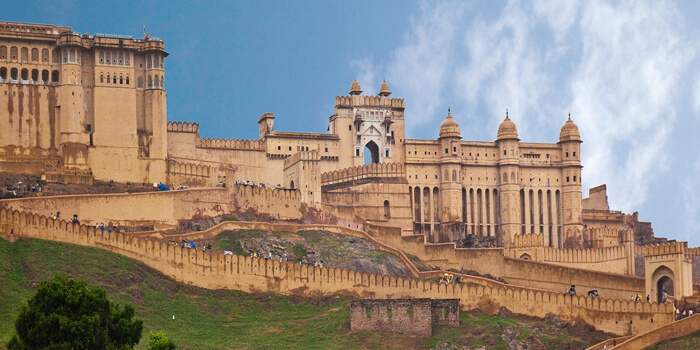 Amer Fort: Amer Fort is a beautiful building constructed with Red Sandstone & Marble. The famous Elephant ride is a must do thing, here. 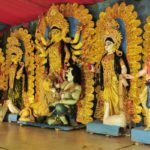 The Shila Devi temple is also a famous worship place here. Nahargarh Biological Park: The Nahargarh Biological Park is a 720-hectare sanctuary on Jaipur-Delhi highway. There are nearly 285 varieties of birds here. 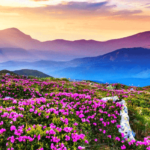 Asiatic lions, Bengal tigers, panthers, hyenas, wolves, deer, crocodiles, sloth bear, Himalayan black bear, wild boar & other flora & fauna are the main attractions. Jaipur is vastly known for its rich cultural & traditional heritage. Beautiful Rajasthani dresses, footwear & handicrafts lure a number of tourists to the markets here. On the way to modernization, the Pink City has some famous malls & shopping centers. However, the old city markets are still the main point of shopping in the city. Check out the shopping spots which you must explore on your Jaipur Trip. Johri Bazar: Johri Bazar is one of the oldest markets in Jaipur. A lot of women visit here as it is the hub for famous Jaipuri Jewelry in Gold, Silver, Diamonds & Emeralds. Kundan Jewelry is also very popular here. Jaipuri quilts, dyed sarees & other women wear can also be found in abundance in Johri Bazar. Bapu Bazar: Another popular market area of the Pink City is the Bapu Bazar. It is the hub for classy Rajasthani textile, handicrafts, footwear, brass works & other items. Tourists from all over the world wander here to find traditional Rajasthani products at giveaway prices. Mirza Ismail Road: MI Road is famous for pottery shops & colorful antiques. However, it has shops for all your shopping needs like textile, jewelry & footwear. You can devour the famous lassi here & quench your summer thirsts. World Trade Park: A bit far away from the old city, the famous World Trade Park is located. The glass towers connected together are a famous spot for branded shopping needs. This mall has a food court & lounge area to relax in between your shopping trip. The glass building is itself a visual delight & is one of the biggest shopping malls in Asia. 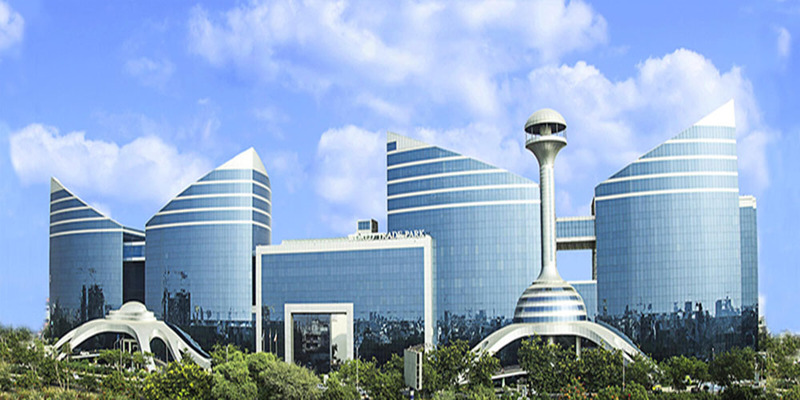 Gaurav Towers: Gaurav Towers has a special place in the heart of youngsters, here. This mall complex has all the shops for your needs. The food court with McDonald’s is the place where you can spend leisure time savoring your favorite delicacies. It is indeed a must visit place. Pink Square Mall: Another popular shopping complex is the Pink Square Mall. It is one of the most loved spots by famous Bollywood stars & celebrities when they visit Jaipur. All your shopping needs & dining will be fulfilled here for sure. Pink City has much more to offer in terms of uplifting your mood & making your trip an unforgettable one. However, these were only just a few spots which we have summarized here for you. Book Jaipur Trip with Footloose Holidays & experience a trip of once in a lifetime.